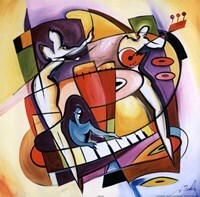 "Abstract Piano" by Paul Brent is a modern rendition of a piano done in brown, beige, black and red. The print is modern in style, with the piano being made up of many shapes and bold accents of red lines in just a few key places. The keys of the piano are also abstract in design, with a break in the middle of them, leaving the keys mis-aligned. Paul Brent is a well-known contemporary artist with many decorative works and styles to his credit. Though he's most recognized for his images of the beach and shore, this jazz piece really represents his more abstract works and the modern art in his portfolio. 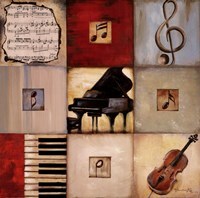 This print is the perfect print for lovers of jazz music or even more traditional pianists. A black frame and white mat are a great choice to finish the piece. A canvas with black or red sides is also a good choice given the modern nature of the image.